Mark Minickiello, VP Legislative Affairs, Northwest Credit Union Association, Sam Marshall, Dolores Marshall and Maria Ayers, TwinStar’s Chehalis Branch Manager at the $5,000 check presentation. 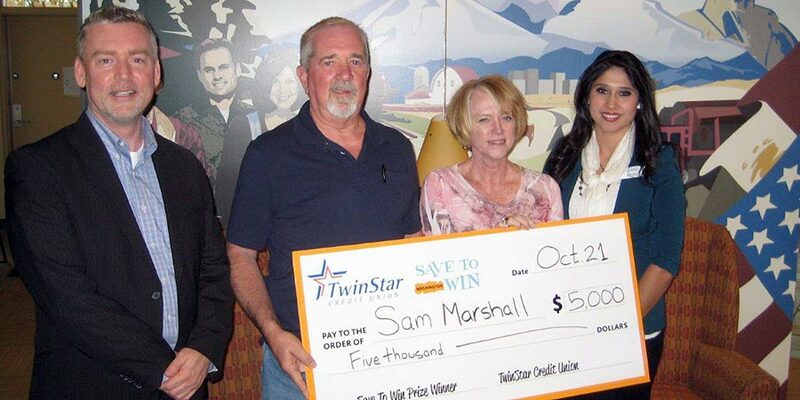 More TwinStar Credit Union members took home a big prize from the Save To Win contest. Sam and Dolores Marshall from Toledo were the lucky winners of $5,000. The Marshall’s have participated in the Save To Win contest for a while now and even figured that one day they would hit one of the big prizes. And they did. Sam mentioned that they will save the winnings and consider what to do with the money over time. Sounds great Sam, congratulations. The Save To Win program is your chance to win cash for saving. TwinStar members residing in Washington can open a special Save To Win certificate at any time. Each $25 deposit to your account enters you into monthly, quarterly and annual prize drawings. It’s a win/win situation - you develop a healthy savings habit, earn dividends on your savings and have the chance to win big! Click here to learn more about Save To Win accounts.